Tying up (Exertional Rhabdomyolysis) is a common cause of poor performance in racehorses and performance horses of all types. It is a syndrome with a variety of causes, but always involves the breakdown of muscle cells which in turn causes a serious, easily recognisable clinical condition involving muscle stiffness, pain and a reluctance to move. 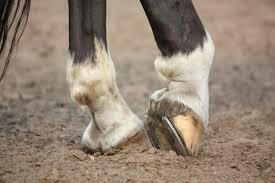 Sub-clinically, it can cause poor race performance or may present as a lameness problem. I did up a basic outline of the condition and its treatments about 15 years ago for one particular client and one particular horse. Since then, I have sent the information out to countless others, and they have in turn passed it on. I have been told by many people who have read this that it was helpful to them, so here it is. Please keep in mind that this is my own interpretation of the papers I have read, cases I have seen, and thoughts on the subject from other veterinarians and horsemen. Your own veterinarian may or may not agree. Some of the information is well documented and widely published. Some is not. I have not referenced any of this as I did not originally prepare the paper for general review, but only for individual clients with specific horses. I hope it gives you something to think about, but please consult with your veterinarian regarding your own particular situation. The muscle enzymes, Creatine Kinase (CK) and Aspartate Transaminase (AST) (and LDH in some places) are checked in serum samples (red topped blood collection tube). CK is an enzyme that goes up quickly and down quickly (It starts to go up in a couple of hours and peaks in about 24 hours). AST is an enzyme that goes up slowly and down slowly (It goes up in a day and back down in a week). D) Exposure to a Virus – recently, I have noticed in the literature references to tying-up in relation to exposure to Equine Herpes Virus (Rhinopneumonitis). I don’t know the mechanism behind this, but will update this at some point when I do. Fillies and mares lose more electrolytes in their urine (especially when they are in heat) compared with geldings and stallions. Anatest – 5cc IM every 2weeks – this messes up the hormonal cycle in fillies, so they shouldn’t lose so many electrolytes in their urine. I don’t have any idea why progesterone (in Regumate) doesn’t work as well for this, but it doesn’t seem to. In New Zealand, you cannot use Anatest, so you must make do with progesterone. Hydroxy-P 500 is no longer allowed in NZ either. Electrolytes – increase daily electrolyte supplementation in feed – try doubling recommended levels. This will ensure that the horse has sufficient electrolytes available. They will urinate out the excess anyway, but will keep what they need. Also, a small handful of regular table salt each day will increase water consumption. Dunstan “all-you-need” contains about 3-10 times the electrolytes contained in most feeds. Switching your concentrated feed to Dunstan “all-you-need” will provide all the electrolytes you require. Chromium – chromium has many effects, but for racehorses, its best effects are on muscle cells. Chromium ensures that muscle cells are bathed in more fluid and electrolytes. It protects muscle cells from lactic acid accumulation and the damage that results from it. (i.e. finish races better with decreased lactic acid at the end, and prevents tying up) It also acts as a natural anabolic, causing the horse to put on more muscle than fat. It makes insulin work better, so anything insulin is involved in will be affected by chromium (I.e. it helps boost the immune system). Only certain forms of chromium are useful, and the one from Nutritech (Altech), Biochrome, is the best. It is in a form that can be absorbed and used by cells well. It is also very safe. Read the label on the tub. You will need to use four times the label dose for the first two weeks, then you can cut it back to about two to three times. That means you could feed 8 scoops (20g) every day for the next two weeks. Then, feed 4-6 scoops daily after that. Dunstan “all-you-need” contains Chromium. Vitamin E/ Selenium – generally, selenium is included in supplements as sodium selenite. This is an inorganic form, and some horses are not able to absorb it or use it that well. If you are continuing to have problems, you can feed a yeast-based selenium. It is in an organic form that cells can easily absorb and use. It is put out by Nutritech (Altech) as well. Dunstan “all-you-need” contains yeast based selenium from Altech. Keep your horse sound – have a lameness exam done, treat the significant problems, and treat with glucosamine regularly to repair any damage present in joints and to prevent the reoccurrence of problems. Calcium Supplementation – feed skim milk powder regularly. It is in a good form for absorption. The balance between calcium, magnesium, and phosphorus is important too. Baking Soda – you can feed baking soda so long as you stop a good 24 hours before racing. Check with your veterinarian about the dose and when to stop. Traumeel – may be useful about an hour or two before training. It is a good muscle anti-inflammatory as is herbal so it has no withdrawal time (but you are not supposed to give it on raceday, anyway). Give it orally. Feed High Fat, Low Soluble Carbohydrate Diet – This is the most important way to prevent tying up. 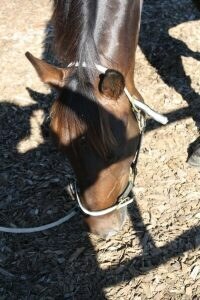 The way you feed your horse is the most vital factor. A really good study was done on quarter horses and thoroughbreds several years ago. It showed that if you fed horses on a high calorie diet they were more likely to tie up than if you fed them a low calorie diet. Obviously! It also showed that WHAT you fed affected the incidence of tie-up. If you fed a high calorie diet that was low in soluble carbohydrate and high in fat, you had a low incidence of tying up, while a high calorie diet that was high in soluble carbohydrates caused a lot of tying up. Soluble carbohydrates are grains like oats and barley. Insoluble carbohydrates are hays, grass etc. In New Zealand, a great feed to try is Dunstan “all-you-need”. In North America, a good feed to try is Purina’s Competitive Edge. Both are high fat, low soluble carbohydrate, fully extruded feeds. Feed them with free choice, quality hay or grass. Dunstan “all-you-need” has the added benefits of MSM. This is a derivative of DMSO, a great anti-oxidant and useful in the management of lameness, as well. Don’t feed them if they are not working – if you are giving your horse a day off, cut out the grain part of the ration. Contrary to popular belief, they will not starve to death if they do not get grain on Sunday if they are not working. They will survive quite nicely on hay or grass. If you are feeding Dunstan “all-you-need”, you can feed them as normally as it is low enough in soluble carbohydrate. 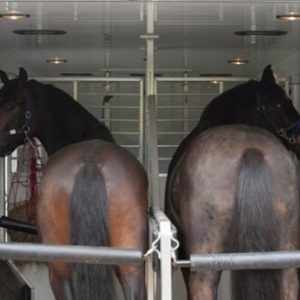 Relax – Since nervous horses are prone to tying-up, it can be useful to treat with various things that relax the horse. Ensure they are receiving adequate B vitamins—especially B1 (Thiamine). Some amino acids are helpful with this as well. Treatments like Modecate can be helpful (it is a human anti-psychotic drug that is in the same class as Acepromazine but acts for 3 months at a time). As the FEI withholding time has increased to 90 days, Modecate is less useful. In some racing jurisdictions, the withholding time is as little as 7 days, though, so check your local restrictions.